The Maremma Sheepdog is a large livestock guardian. Livestock guardians do not herd their charges, but instead protect them. This breed traditionally guarded sheep, living with their charges and fending off predators that included bears and wolves. Even at the loss of these large predators they kept their role by defending the flock from marauding dogs and thieves. An ancient breed, the Maremma Sheepdog hails from the Abruzzi mountains and the Maremma plains in Italy. 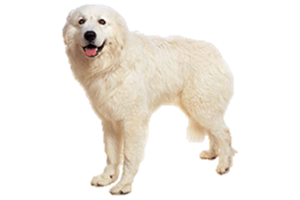 They are closely related to the Kuvasz, Slovensky Cuvac, Great Pyrenees and the other European livestock guardians. In the past the dogs from each region were considered to be two separate breeds, the mountain dog was slightly larger, while the plain's dog had a shorter coat. Overtime these changes lessened, and in the 1950s the two were combined under the name Cane da Pastore Maremmano-Abruzzese in order to recognize both areas, but only the Fédération Cynologique Internationale and Italian authorities have kept the lengthy title. Is the Maremma Sheepdog Right for You?